A steeply arresting reunion of Belgian-based Finnish composer Timo Van Luijk (Af Ursin, Elodie) and Belgian pianist Frederik Croene, who relay a stark series of visions from the metaphorical mast of the world’s sinking ship – utterly compelling, essential music if you’re into anything from Colleen to The Caretaker. So good… Recorded at Van Luijk’s studio between April – September 2017, the duo’s tense suite describes the power and beauty of dramatic fate, “the irreversible” according to La Scie Dorée. 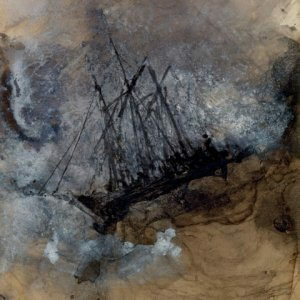 In that sense there’s a palpably unyielding pall of resignation to proceedings, with the record unfurling as a gloomy, tapestry-like narration starring Victor Hugo’s impressionistic LP cover image of a ship in stormy seas as the main protagonist. In nine parts the album shifts from pensive tranquility to roiling, low end piano churn and cinematic chorales with the patience and gripping timing of an ancient storyteller or bard. They select from a broad range of instruments and arrangement techniques to realise a full picture of the scene, but always leaving enough room for you to fill in the gaps, as the story sweeps us from quietly breathtaking synth waves in La Recontre to the swelling crests of Le Choeur Englotui to the incredibly evocative segue of tonal fog into militant percussion recalling Conrad Schnitzler’s work with Mayhem on the LP’s title cut, always maintaining a timeless sense of dramaturgy that keeps us rapt from start to finish. Breathtaking, Quiet music.